Balzer Designs: Hey! Don't Throw That Away! Hey! Don't Throw That Away! As you know, I have a tendency to pull canvases off their frames. This leaves me with some empty frames. To begin, I cut an old patterned transparency into a decorative background. I wanted to use a transparency because I was afraid paper would rip. I figured plastic wouldn't. I also sprayed the frame. Although, I ended up using some gesso to fill in the sides and little holes. And then with Puffy Paint! In the morning I glued the painted transparency onto the back of the frame and I added some tape as well. I added the tape because (a) this is not nice wood -- it's very splintery, and (b) I wanted to make sure the transparency was securely attached. And that's it! Super duper easy earring holder made from trash! P.S. I am a paid spokesperson for the Brother ScanNCut. It is a machine that I love and use all the time! One of the things I often share with students is how to create your own tools. I recently showed my students in Montreal how to cut a tag into a paint wedge tool. One of my students then showed me an even better idea! Her name is Angelle and she shared a ring of room keys/credit cards/gift cards that she had made. She used decorative scissors to cut the edges of her plastic cards. Brilliant! I only own one pair of decorative scissors, a pair of pinking shears, so I cut one card with the pinking shears and the rest by hand because I don't mind things being a little bit wonky. So cool! Durable plastic tools instead of paper ones! We all have so many of those plastic room keys, loyalty cards, gift cards, etc. Instead of throwing them away, why not cut them into a super useful tool!? Like most people, I've got a decent collection of t-shirts that I don't wear because (a) they don't fit or (b) they're stained (especially true for white t-shirts). Instead of tossing them away, you can make super cute boot cuffs with them! Boot cuffs give you the look of socks or leg warmers, but without all of the bulk in your boots! First, you'll need a t-shirt. 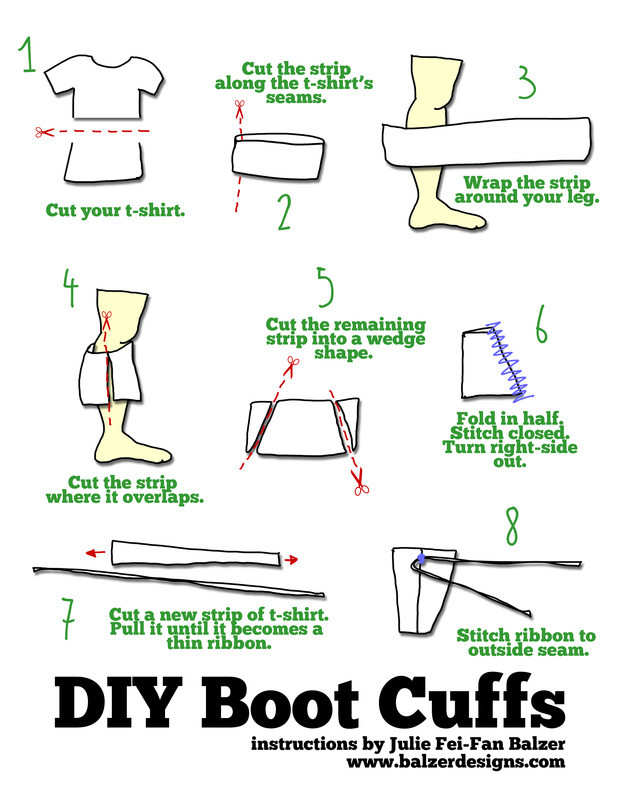 Cut a strip as tall as you want your cuffs to be. Now, cut the ring you've cut off into a long strip. Wrap the strip around your calf and pull a bit tight. Snip the strip where it meets the other half of the strip. I wanted to avoid the t-shirt's side seams, so I ended up cutting my strip into four pieces. The pieces you wrapped around your your calf need to be cut into a wedge shape in order to properly fit your leg. After all, your leg isn't a tube, it's tapered. This is an eye-balling process. Jersey (t-shirt material) is very forgiving and it doesn't ravel (that's why we don't need to finish the ends). Place the two sides you've cut into a wedge together to create a kind of cone-shaped tube. In the photo below I'm pointing at where you'll stitch. Stitch along the seam to create the tube. I recommend pinning the fabric because jersey stretches a lot. Now we're going to do my favorite t-shirt magic trick! Cut a thin strip of t-shirt and stretch it. I will become a cool little tube-y thing. As a side note, this pulling technique is how you can make a t-shirt scarf or necklace. Stitch your newly created string to the outside seam of your cuff. And that's it! Check out this 30-second video to see my boot cuffs in action! Lots and lots of possibilities! I can't wait to cut up more t-shirts in a whole rainbow of colors! And here are some instructions I drew up for you! You can download a printable version of the instructions HERE. So you know that I love empty toilet paper tubes. I use them all the time. But you don't have to leave them "as is." The soft cardboard is easy to form into lots of different shapes! I was super thrifty and cut my toilet paper tubes into smaller chunks in order to create six unique stamps. Well, the plain old circle probably isn't that unique...but let's keep that our little secret, okay? As you can see, I used acrylic paint on top of black tags. It's kind of a cool effect. But then I decided to break out my Gelli Plate. Finally I started making some little flowers by combining two of the toilet paper tube stamps with a stem. Toilet paper tube stamps are a quick and easy way to make some fabulous marks with something you throw away all the time! So rescue a few tubes from the trash and have fun with them! I hope you'll give it a try!